Do you know what is Gateway of Tally? Do you think you know what is Tally? You must be knowing the meaning of Gateway of Tally as it the menu that opens up every time you open Tally. I completely agree to that. But do you want to know the best part about Gateway of Tally? It is its simplicity and division of functions in a way so that you can understand Tally with ease. 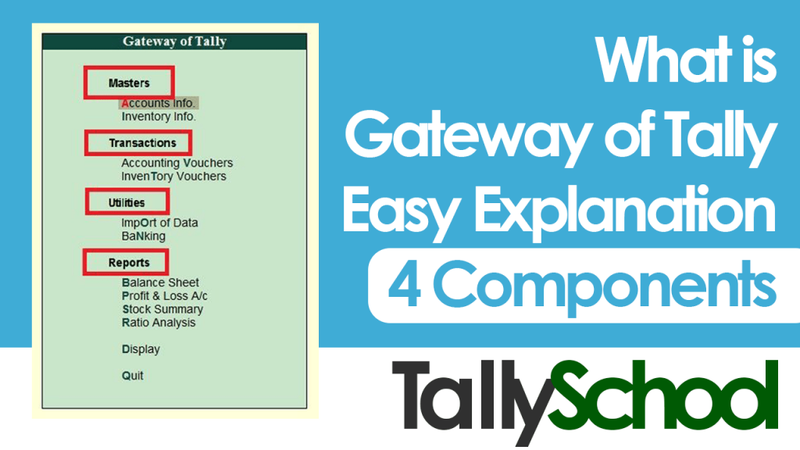 I am going to explain you the components of Gateway of Tally screen knowing which you can use Tally in an easier way. Each component has its own function and contains several options which you and I use on a daily basis. Let us know what each component represents step by step. Accounts Info. 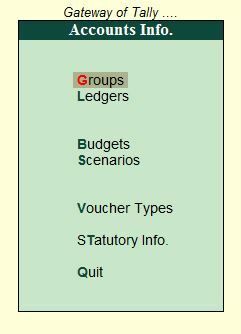 includes everything about ledgers, groups of different ledgers, budgets, scenarios, voucher types and statutory info. In other words, anything accounting apart from passing entries has to be done through Accounts Info. If you want to create or alter a new ledger, you have to go through Accounts Info. or if you want to create a new voucher type, you can create it through Accounts Info. You can also create budget as well as Scenarios to see how the accounts look in certain conditions and these two options are contained in Accounts Info. Accounts Info. 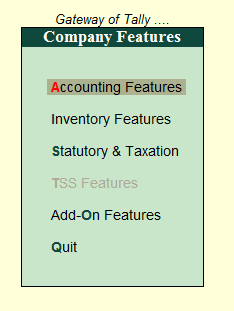 is under the Masters option in Gateway of Tally because it allows you to create and alter different accounting options. Now let us talk about Inventory Info. As the name suggests, it includes everything about stocks or in accounting terms; inventory. 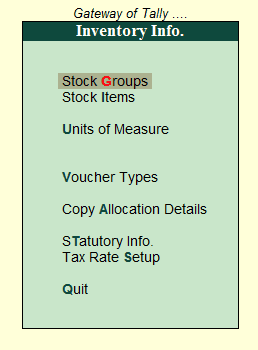 Similar to Accounting Info., you can create and alter Stock Items, Stock Groups, Voucher Types as well as Statutory Info. This is where you can create stock items and group them on the basis of Stock Groups for further classification of your goods. For example, you have Mobiles and Computers at your shop. You can create a group called Mobiles and put the Stock Item in that group known as Apple Iphone X and Samsung Galaxy S8. In the same way, you can create another Stock Group called Computers and put in the Stock Items like Samsung Laptop and HP Laptop. You can also create Units of Measure in Inventory Info. which is very necessary. Units of Measure from above example would be numbers since we can calculate mobiles and computers in numbers. It can be KG, Litres or Feet as per your stock. Let us move onto the next part of Gateway of Tally which is Transactions. Transactions part is one the most used components on the Gateway of Tally screen. It is used for creating accounting entries as well as inventory entries in Tally. There are four basic accounting vouchers in Tally. They are Contra, Payment, Receipt and Journal. Apart from that, there are some more vouchers such Sales and Purchases, Credit and Debit Note, Memos and Reversing Journal. 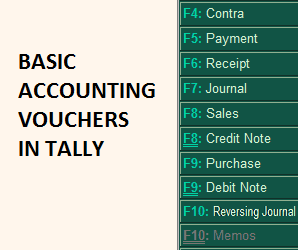 Whenever you need to create or pass an accounting entry, you have to go to the Accounting Vouchers in Tally. It is under Transactions because whenever you create an accounting voucher, it is a kind of a transaction. Inventory Vouchers are mainly used for entries pertaining to manufacturing or assembling businesses. When you have a number of components and you manufacture a finished product – inventory vouchers are used for recording that entry in Tally. For example, you manufacture a pen from ink, nib and a body. This kind of entry can be recorded in Tally with the help of Inventory Vouchers. There are other advanced inventory vouchers such as Rejections In, Rejections Out, Delivery Note, Receipt Note and Godowns which are used in accounting entry for manufacturing purposes. Moving on to the third component of Gateway of Tally screen which is Utilities. 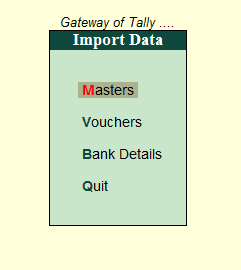 By using this option you can import Masters, Vouchers and Bank Details in Tally. You can import all of these in Tally from here. 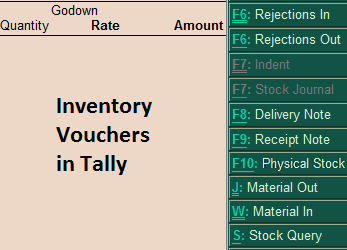 You can import Masters and Vouchers in Tally in Tally XML format only. That simply means if you want to import Masters and Vouchers in Tally, they have to be exported from Tally itself. Although, you can import Bank Details in Excel format. Next option is Banking itself. Banking is one of the new options which was not present in the earlier versions of Tally. With the help of all the options in Banking, you can easily maintain all of your banking information at one place in Tally. There are options like Cheque Printing, Cheque Register, Bank Reconciliation, Deposit Slip, Payment Advice and Post-dated Summary. You can simply print a cheque from Tally. Isn’t it amazing? Bank Reconciliation is also one of the features that can help you a lot and save your time in accounting. Deposit Slip is nothing but a list of Cheque Deposit Slips and Cash Deposit Slips all of which you can access through Gateway of Tally. Now let us move onto the last and the second most important component of Gateway of Tally after Transactions. It includes Balance Sheet, Profit & Loss A/c, Stock Summary and Ratio Analysis as four basic reports in Tally. 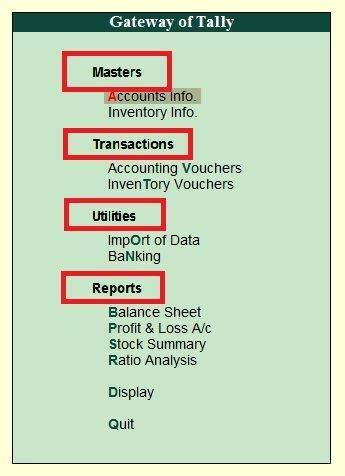 If you do not know, all of the reports above are automatically prepared in Tally on the basis of how we create our accounting entries and therefore they are called reports. The definition of a report is that it takes information from what data we enter and displays it in a concise and the needed format which in our case may be a Balance Sheet or a Profit & Loss A/c. You know what a Balance Sheet is. In case you don’t know, you can go through the Free Basic Accounting Course in which I have explained it in a simple manner. In simple words, it displays all your assets and liabilities in one place so that you can take important decisions about your business. Profit & Loss A/c displays all of your business transactions in this year and on the basis of that, you can see whether there is a profit or loss this year. Again, Profit and Loss Account is also automatically prepared in Tally with the help of the entries we create. Stock Summary displays all the inventory that you have or sold or is manufactured by you. It is really a neat and clean way to see at one instance how much you have in stock. You can also check the profits that you made by selling the items that were in your stock in Stock Summary. If you have created Stock Market Entries in Tally, then Stock Summary will show all shares that you have purchased as well as sold. Next option is Ratio Analysis which is generally not used by many people except professionals. Ratio Analysis is contains several principal accounting ratios and principal groups of accounting in Tally. On one side, there are principal accounting groups and on the other side there are Principal Accounting Ratios. The reason Ratio Analysis is only used by professionals only because they are able to understand the true meaning of these ratios and take an informed decision. Ratio Analysis is a great report in Gateway of Tally only if you know what the ratios actually mean. Another option after Ratio Analysis is Display. If you notice there is some space after Ratio Analysis and then the Display option is situated. It is because it contains 35+ reports, registers and statements which are required for running a business including GST Reports. That includes all Account Books, Day Book, Accounting Statements, Statutory Reports which contain GST Returns and many other statements and reports which are necessary which you would require even if you are running a small business. This is a bonus for you because you read the whole post till now. When you enable all the features in the Features menu at the Gateway of Tally, you will see much more options than what you generally see. Here is how you can enable all the features. From Gateway of Tally, go to Features or press F11. Now go to Accounting Features and set Yes to everything that is set to No. Do the same with Inventory Features as well as Statutory & Taxation. Now, again come at the Gateway of Tally and you will see much more options than what you saw at the beginning of the post in Gateway of Tally. Here is the picture of all the advanced options enabled by me in Tally. 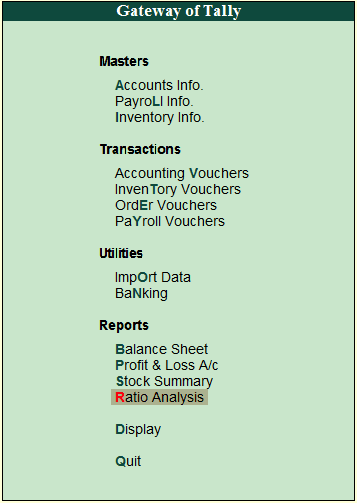 You can see Payroll Info in Masters which was not present earlier. 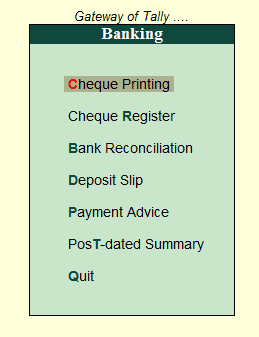 Similarly, you can see Order Vouchers and Payroll Vouchers in Transactions. When you go in any of the options present in Gateway of Tally, you will see much more options now than before because we have enabled them. The functionality in Tally works in an interconnected fashion therefore when you enable a single new feature it gets enabled in many other functions at the same time. Gateway of Tally is the place where everything in Tally starts and it is the same place where everything Tally ends when you want to finish the work. You create a ledger, create an accounting voucher, see it in the Balance Sheet and at the end you would come back at Gateway of Tally, when the work you are doing is finished. Gateway of Tally is something that if you understand it, you will easily know where every function of Tally actually is in Tally. I am sure I have explained Gateway of Tally in a simple and easiest manner possible. Still, if you have any kind of doubts or suggestions or you just want to say thank you to me, comment it down below and I will be happier than ever. The funny thing about Gateway of Tally is that it is called GoT in short. All the Game of Thrones fans will understand what I am saying. P.S. – Another funnier thing is that just like Game of Thrones, in Tally, everything starts and ends at GoT.